Publisher: Pinnacle Books, New York, NY, U.S.A. 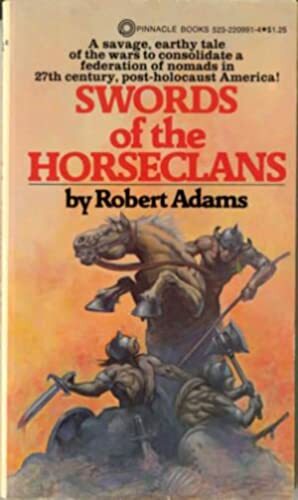 Taking place after a nuclear apocalypse, the swords of the horseclans is a continuation of the story of the High Lord Milo and his horseclans. He and his allies have to face an army comming from the south and face the evil Witchmen (20th century scienctists) once again. Stuart W. Wells III, 224 West Norwalk Road, Norwalk, CT 06850 U.S.A.
ALL ITEMS are subject to prior sale. Items may be reserved by telephone, fax, or e-mail. Available items will be held for 7 days pending receipt of payment. REMITTANCE: Payment by Paypal, check or money order in U.S. funds. Connecticut residents should add 6% sales tax or valid Resale Certificate. Checks must clear before shipment. For best speed, use PayPal. Orders usually ship within 2 business days. Shipping costs are based on books weighing 2.2 LB, or 1 KG. If your book order is heavy or oversized, we may contact you to let you know extra shipping is required. Mass Market Paperbacks and some other light weight books can sometimes be shipped for less, and additional paperbacks may fit in the same package, in which case shipping rates will be REDUCED for your order. Most international shipments are sent via Global Priority Flat-Rate Mail which is generally cheapest except for the lightest packages.